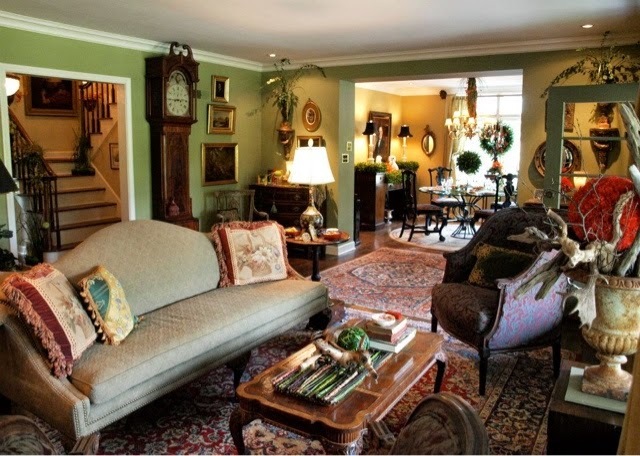 Well last week I was visiting Ramon's blog "Rowhouse Events and Interiors" and he posted pictures from the home of a floral designer he's been working with. I was studying all the details in this living room (I think it's a wonderful blend of fabrics, textures and classic design) and my eyes locked in on the wall next to the opening. See the the antique gold wall shelves that have the gracefully arching tall plants (there is one on both the left and right side of the opening). I think they look like palm branches but I can't be 100%. I've been looking to do something on my mantel and this struck a bell! (here it?) OK so I couldn't find anything as classy as these but here is what I found. These are a cluster of palm branches that I found at Hobby Lobby. I arranged the cluster to look as large and spread out as I could to get some height and width. I know they aren't as graceful and artistic as the idea from the inspiration picture. I have zero local resources for the high quality faux plants. I used to have 3 sources but they've all gone by the wayside. The sun was beaming in and there was a nice gentle breeze- such a classic summer day. I drew the curtains closed to soften the look. I hadn't changed this arrangement since the early spring when I put some white orchids up there as seen "here". I think you could mix the orchids with the palms and go for a BANG! It looks fresh and exotic this way. The orchids - if you chose to try - will add drama and make it a fuller arrangement. I like it very much. You can even play with pine when Winter arrives. Oh the possibilities... I would never have thought of putting plants "up there" and the result is lovely. What a fabulous look! I love the palms and I thought the orchids looked fantastic too! You have such a beautiful home, great taste, Liz! Very pretty... perfect for the summer months Liz...love those beautiful urns too!! Love the look, especially for summer. The urns look fabulous with the palms. It is get to get inspired. This is a beautiful look, although I cringed when you said you went to Hobby Lobby to get them. I'm feeling strongly about that whole thing... I love your serene neutrals in this room, and you could even extend the summery look with some accent pillows in green. LOVE it! The palms look amazing, especially with the arch on the mantel and windows. I have few resources for good quality plant material, too, bit yours look really nice. I have some old palm-looking fronds and ferny plants in the sconce things in my family room, but yours look so much nicer. Good eye to see them in the inspiration photo! I love the palms. Did you see my palms on the entry table? I ordered them online. I love the palms! So pretty. Your inspiration room is gorgeous, too!